Well, they DID use one of his tracks in the teaser... Could be a double-edged sword though. I don't think there's a Silent Hill soul on this planet who's not praying for Akira to return. I'm not. I got bored of the same sounds again and again. I'd like to see stuff start fresh and scare me again. Silent Hill 1 & 2 were great and scary because they were so new. There's only so much we can get from treading the same ground again and again. I hope Kojima really thinks outside of the box and makes it new. Also, why would you get Masahiro Ito when you have Guillermo Del Toro?? This is just nostalgia talking, guys. We've had enough of the same. Well, Del Toro has a distinctive flair to the monsters he designs, but I think Ito has actually improved quite a bit since his Silent Hill days. 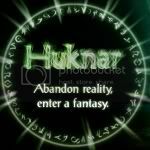 His site has many designs that I would love to see realized in the new game engine. I think his White Hunter series and dabbling in Cyrillic text on his creations would be really awesome in context. We really haven't had enough of Ito, in my opinion. EDIT: I will say, though, I kind of agree with you about Yamaoka. His style is easy enough to emulate/improve upon, as the P.T. shows. Honestly, I think Akira needed a break or inspiration or both. I am willing to see his return, but if someone else can do it, by all means, I want the best person possible to have the job, and don't want to be so clouded by nostalgia that we are missing out on another option. I don't think it has anything to do with being clouded by nostalgia. No one else has made a horror game soundtrack even close to as good as Akira's early ones. They were incredibly evocative, memorable, and atmospheric are all at the same time. I think he was doing amazing work for the first 4 games. Granted, it did seem like he was going through the motions in those later games, but I really don't blame them. They were mediocre horror games by western teams and I doubt he could have felt much connection to them. However, this new project might be just the thing to bring his inspiration back. So I'd love to see him come back. The music in the teaser was pretty good though, and I wouldn't mind seeing what a new guy could do. Horror soundtracks are really tough, though. With ambient music, It's so easy to make it sound just like every other horror soundtrack, and have all the tracks sound the same. Lots of horror games fall into that trap. But Masahiro is kind of a must for me. His designs are unlikely anything you ever see. There is something demonic, otherworldly, but ultimately human about his work. The colours, the textures, the abstractness. 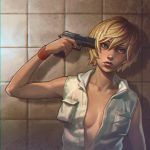 Take a look at the original Silent Hill 1 artwork and just think how fantastic they could be rendered in the Fox Engine. It would be as if his art just walked off the page. And for me, only Ito and a select few artists are able to do that. I know what you mean, but a different aesthetic and feel for the monsters is not necessarily a bad thing IMO. The main thing for me is that the game is scary, and that the designers give it a distinct voice. If they can do those things, then I won't mind a different feel. I don't quite agree. Just like the thick fog, darkness(which newer games have just completely ignored...) and flashlight, the enemy designs are what make a Silent Hill game. You could never put it down to another zombie game, or ghost game, or game with demons. It was always a game with things. Creatures and the fear of being unable to understand them. It wasn't but a few days ago I was playing the first game with a friend and when we first encountered the mumblers (clawfingers) he kept asking, frustratedly "what is that!" I won't deny that another artist could pull that off, but what I am saying is that there is a certain aesthetic that any deviation starts to pull the game into the areas that it was once so fascinatingly different to. I would rather they enlisted Ito who hasn't worked on a Silent Hill game in a long time, just to play it safe and bring in that familiarity to it. (I'm sure his time away means his ideas would be very, very fresh, but noticeably "Silent Hill". We've got an opportunity here to show the world why these games used to be the best horror you'd ever experience and I'd rather do that by relying on the older merits than newer ones. The last thing I want to see is the Silent Hill series forever changed because of a different artist. I should finish by saying that I am not against innovation and new ideas, just that there are some staples they'd do better to keep. The problem is it's really hard to keep something so vague. When it comes to monster design, I'm open to anything as long as it's interesting. Plain old ghosts and zombies would be awful, I agree. All I want from monster design is something unexpected, something twisted, something imaginative. I find Guillermo del Toro's creature designs to be very fantasy-like and not incredibly appropiate to the silent hill atmosphere overall, I don't feel theyre twisted enough. I think Ito's design are like 10000000x superior and much more fitting to the mood and story of the series. Masahiro Ito was asked on twitter and he responded. 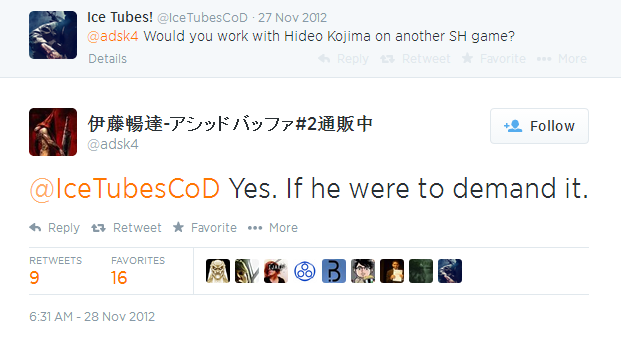 Unlike Akira Yamaoka's response which doesn't tell us anything. Ito's response indicates that he's had no involvement so far. But he's open to it. That said, I believe it's unlikely that Ito will be back. I'd guess that it's most likely Del Toro will assemble his own team of artists at his second house that he bought specifically to store all his collectibles, and he and they will be the ones working out creature design. Someone should ask Kojima about Ito. I don't care if either Ito or Akira come back... Especially Akira since he basically stated he was done with the series.... But having Ito once again would be pretty awesome. I'm not expecting it but it's been quite a looong time and I'd looove to see any new design he comes up with. But again, not expecting it to happen. Which is fine. Edit: Out of curiosity sake, has anyone contacted Ito about it via Twitter lately? Not sure about twitter, but a handful of people have contacted him through his personal blog, so I'm sure there've been efforts elsewhere as well. Makes me feel guilty just thinking about it. I'm not. I got bored of the same sounds again and again. Well it's been a while since he has composed SH-related stuff. I'm sure that now he has more than enough inspiration to deliver something fresh and new. Silent Hill 2 has still one of the best soundtracks I've ever heard, and I'm sure he could deliver something that good once again. He just needs to stop using the same old samples over and over again. Literally every single soundtrack he's made sounds completely different from one another what are you guys even talking about. Well, he's had a tendency to overuse Mary Elizabeth McGlynn. Her songs in 3 and 4 were terrific, but after that they've gone downhill. Putting the songs aside, I think each of the first four games manages to have it's own style for background music. I think Homecoming and Origins are the low points for him... even the background music doesn't really stand out, they feel very phoned in. I think he made a bit of a comeback with Shattered Memories' soundtrack, which has it's own distinct feel. I still think Akira is the best there is when it comes to making horror game soundtracks. There's just not a lot of good competition out there. Horror games tend to have boring, phoned in ambient soundtracks where every track sounds the same. What I'd love to see is a horror composer who could draw influence from John Carpenter's early scores, or Goblin (actually the first Clock Tower game sounds very Goblin inspired, and it's amazing!) But since no one seems to be interested or able to do that, Akira still seems like the goto guy for horror soundtracks. Agreed except for one Homecoming track. Say what you want about the game, but "One More Soul To The Call" is one of his best songs because of her vocals. We need more Joe Romersa! I agree! More Count Chocula!